Do you want to learn how to hack twitter?, Are you looking for a way to hack your friends twitter account without them fiding out? Interested in finding out ways to hack someones profile? Maybe you want to take a quick peek at their direct message inbox, steal their username or find a glitch to use a hacking script.In this article I will show you a fairly easy step by step guide on how to hack twitter user accounts without having to directly hack into twitter or their computer and risk getting caught...ignore all those hacking services, twitter hacks and hackers that charge you money for something you can do on your own for free...hack the password of any of your friends accounts and get their password even as a prank or joke. Hack twitter, hacking twitter passwords from user accounts and find out someones twitter password...Is any of it really possible? Yes it is!. Surely you've heard on the news of how President Obama's twitter got hacked or a few other celebrities. 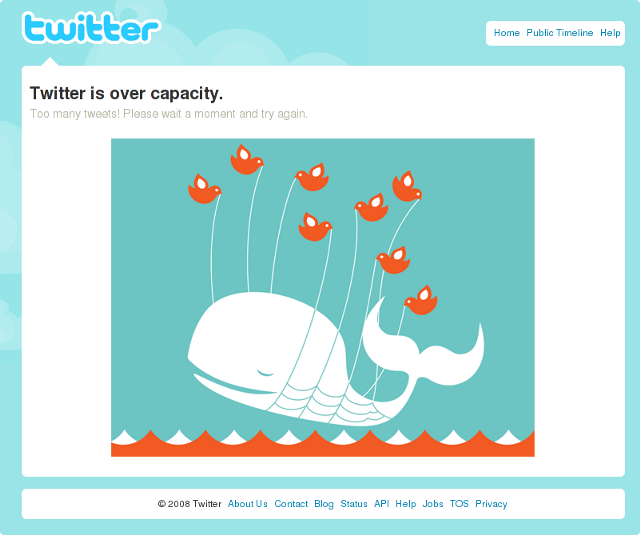 It is all due to twitter's poor coding/programming which causes all those errors like THIS POPULAR ONE. 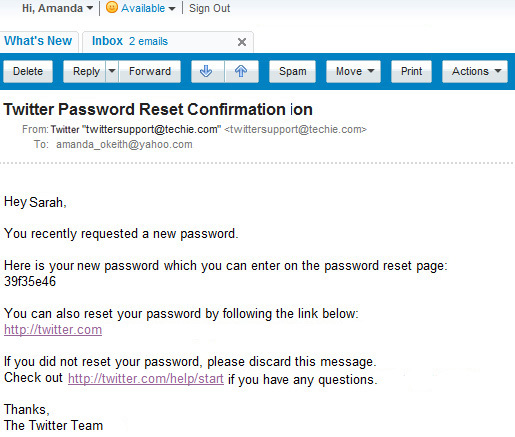 A couple of month's ago I wanted to check my old Twitter account but forgot what email and password I had used to sign up, I sent an email to their technical support but they didn't reply so I decided to put my geek skills to good use and find a way to get my login information back by writing a twitter account hacking code or exploit as they are called. Twitter has two databases (one for males and one for females users) where they keep all the information from their users, if you remember the email you use to login but forget your password, you can use the 'Forgot your password?' option, however if like me you don't have any of that information it's impossible to legally recover that account. If you know anything about programming websites you know the 'Forgot your password?' service has to be in direct contact with the databases in order to send requests to retrieve the forgotten information for you, basically what that means is if you 'ask' the database for the login information with the right 'code' (in our case exploit), it will send you back that information. So all I had to figure out is what the code was and what system they used to contact the databases through the 'Forgot your password?' service, after a few weeks of writing and testing codes I came up with the right one for the job and after doing a bit of research I learned Twitter uses something similar to an email service to contact their databases. But as usual, everything isn't as easy as it seems. For security reasons the databases are programmed to verify the account your requesting is actually yours and not someone elses so they need some type of authentication or verification (thats why they send you a verification link to your email when creating your account or changing your password), luckily for us Twitter is so poorly programmed they also allow you to use a friends/followers account to verify your own (it's a glitch in the "Mutual Friends/Followers" service where they authenticate accounts by checking if the associated friends/followers email is related to the 'victims' account), in other words, if the person you want to get the login information from is following you on Twitter and your following them...you can use your own account to verify theirs (by confusing the database into thinking we are checking if you both mutually follow each other rather than the true act of reseting their password and getting them to send it to us) and get their login email and password sent to you...but the victim must be following you and you them. 1) First off you will need to get your username and the victims username, how do you do this? Write it down somewhere as you will need to use it a bit further down, once that is done you may continue to step 2. 2) At the bottom of this page I have pasted the exploit code I created to fool the databases, this is the tricky part as you will have to edit the code a bit yourself so that it fits your needs when searching for the victims login information. Scroll down to the bottom of this page and find the code I have highlighted in gray so you know what to copy, select the code and copy it to your clipboard (press CTRL+C) then paste it (CTRL+V) on a notepad or text document so you can edit it. 1. Should be the victims username. 2. Should be your twitter login username to verify your the victims follower/friend. 3. Should be your password so the database can authentic you really are mutually following each other with the victim. When editing the code, don't accidentally delete one of the quotes (") or it won't work, so make sure you put the information inside them. 4) Now that you have the exploit code edited and ready to send, we are all set to send it to the database through an email, since it's not your regular email but an exploit email we will have to use a special Subject so the database knows how to read it in programming language. 1. 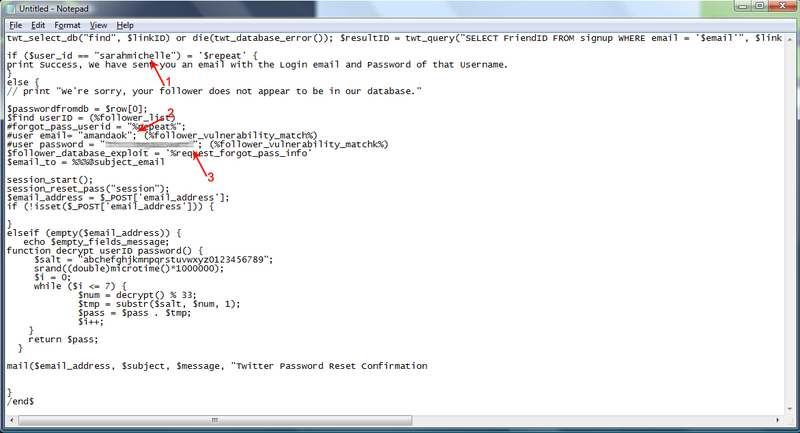 The email address of the twitter database's forgotten password customer service. 2. This is where you insert the victims username. 3. This is where you insert the victims gender (as mentioned above the twitter database is devided in a male section and female), put an M inside the quotes if they are a male or a F if they are a female. 5) After you have correctly written the To: and Subject: sections, you may proceed to insert the exploit code you previously edited in step 3 into the body section of the email. Now all you have to do is click Send and wait for the database to send you back it's reply with the information. print Success, We have sent you an email with the Login email and Password of that Username. // print "We're sorry, your follower does not appear to be in our database."